COMMERCIAL-GRADE 48-FEET RUBBER WEATHERPROOF STRING LIGHTS,Unmatched industry-leading wiring to handle more current than ever before. The permanent solution to illuminate any venue outdoors or inside. Festive,Decorative,Romantic,Functional and Durable.Define New Dimensions. Create Beautiful Canopies. Transform Your Space Today. Nostalgic, decorative lights in sturdy black casing make your twilight or nighttime gatherings feel more like an event. Use them for wedding receptions, garden parties, tree-lighting ceremonies, or outdoor art exhibits. Strings of light enhance the mood of any evening meal, from an intimate dinner for two on your deck to a night out with friends at a sidewalk cafe. Ambience PRO Lights are approved for residential as well as commercial settings. Manufactured with a high gauge wire these string lights will withstand the outdoor elements leaving a lasting impression on your friends, family, and guests. INSTALLATION INSTRUCTIONS : Ensure all bulbs are removed from sockets, and sockets are empty. In case of windy conditions, install strands far apart enough so bulbs don't collide into each other or anything else. For one-person or high installations, secure each end of strand securely, one by one. To prevent bulbs from breaking upon impact, move strands slowly during installation. We have many successful lighting Engineering projects in USA, Canada, Italy, Britain, France, Australia. 2-PACK -- 96ft in total. 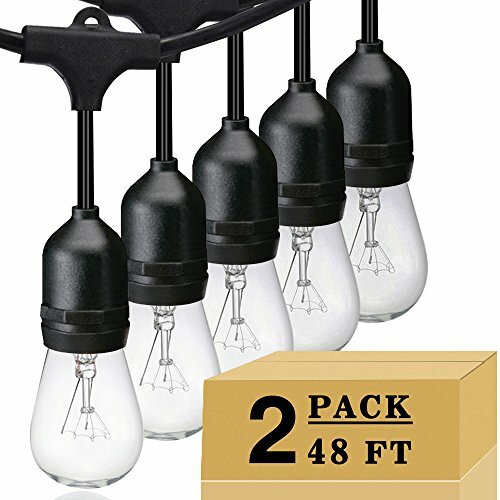 2 x 48ft long patio string lights with 15 suspended sockets, 3ft/bulb, 18 x 11 watts S14 incandescent bulbs included, 3 spare bulbs. WATERPROOF -- SUNTHIN outdoor string lights are made from heavy duty wire and have special weather-proof sockets that form a seal around the bulb string lights to keep water out. EXTRA CHANGEABLE INCANDESCENT BULBS -- Our string of lights includes 18 Incandescent bulbs with 15 standard E26 sockets. Sockets will fit any bulb with compatible base so you have the option of switching up your style. LINKABLE -- This is a commercial grade outdoor light strings with black wiring. Female plugs are attached to easily connect strings end to end. ETL APPROVED -- Patio lights has been tested and meets the requirements of string lights safety standards, as determined through independent testing.